Brenda Russell presents 937 Byng Street on Vimeo. The perfect Oak Bay town home alternative! A 2009 addition as well as upgrades. Entry to this impressive home and garden is through the statement entry way. 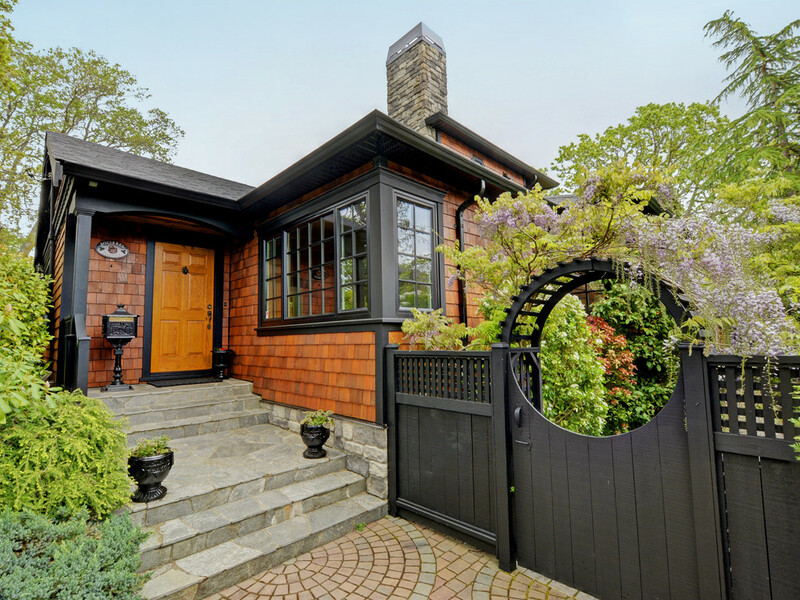 Drive on wide pavers, notice the professional charming design and continue up the flagstone stairs leading to the wooden entry door... this sets the tone for a home on one of the best streets in South Oak Bay. The two generous bedrooms and bathrooms are spread over two levels. The grand master suite on the upper floor features a walk-in closet and a gorgeous outlook over the gardens, making it difficult to do anything except sit back and relax. The 1700 square foot floorplan offers ample room to host family and friends, with a music alcove, formal dining and cozy living room. The kitchen is the heart of the home and is equipped for the ultimate food lover, boasting endless cupboard space, a gas cooktop and island, and offering a view of the luscious backyard. Outside, the magnificent landscaped gardens and façade (Hardie Shingles) of the house are truly show stopping. The contrasting, rich brick coupled with dark charcoal highlights sets this home apart from the others. With professionally designed, lush gardens, this amazing space will be one of your family’s favourite places to gather. Extra features include a spacious attic, outdoor accessory building/shed perfect for the 'do-it-yourself' enthusiast, a freshly updated colour palette and wooden floors. This home is located close to the Victoria Golf Club, the marina, and a number of waterways. Also nearby are great public and top private schools, sporting facilities and the ‘Avenue’ where you will find all amenities including shops, banks and restaurants. A very rare and private home.